Footpath from Bottling Wood to the Douglas marked as Unlikely to Flood. Is this the path with the old bell pit at the side higher up Reverend? From my experience of walking on footpaths this sort of path/steps becomes a torrent after rain. Water has to go somewhere & this is an easy channel for it. Nice woodland pic. I think that when Rev. Long took this pic the 'Yellow Brook' would be behind him. Bottling Wood would be in front of him. I know this footpath like back of my hand. I don't know, Neil. 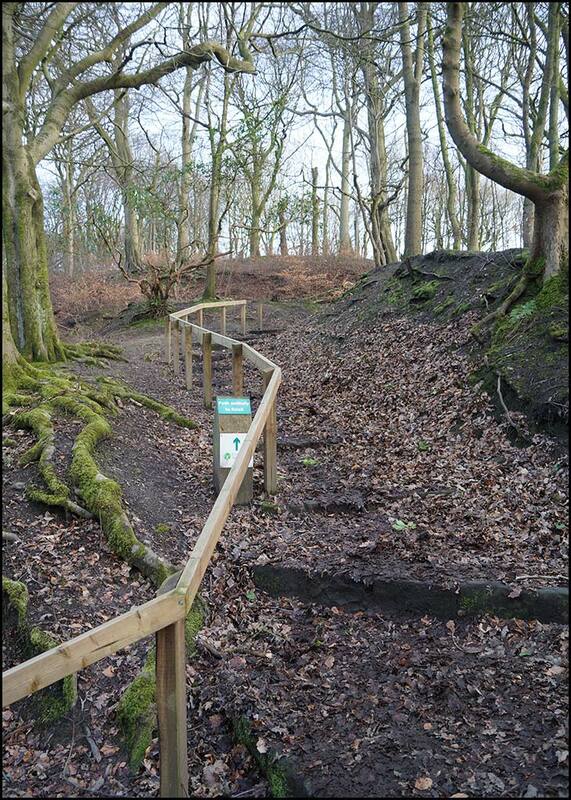 Philip H is right - the path leads down to the brook, where you cross over a wooden plank bridge to get to the main path from Plantation Gates to Haigh Hall. It's the first time I'd been down there, walking from our daughter's at Whelley to catch the bus home from Wigan Lane. I'd gone that way to see if I could locate The Woodlands and The Marie-Bonne (yesterday's p-a-d). Those steps look quite slippery, especially if torrents of water flow. Possible compensation claims? with all due respects Reverend,i know we all call them the Plantation Gates . But in fact they are actually called Prospect Gates,this is a common mistake we all make. I agree with you Anne.Wet or dry they should be clearly visible to walk on. If that's their proper name, I wish folks would use it. It's very confusing having another Plantation Gates off Whelley. I fear, however, that you've lost this battle, Barry. A Google for Plantation Gates only brings the Wigan Lane gates up, with pics going back over a century, and Prospect Gates brings nothing connected up. Someone already been in the same frame of mind as you DIRTY HARRY.. top section been taken by some thieving so and so.... should have their fingers cut off !!! Get some psychological help, dirty harry...and (maybe) put the wood back where you found it. Anne, surely these footpaths are "use at your own risk" and certainly not compensable. Questions, anyone??? A good place for a mugging don't you think Mick. Is this place not close to the place where Dogs have been attacked by stupid daft untrained off the leads dogs ? dirty harry...... you state the rail is not serving any purpose.... it's there for anyone needing a bit of help getting up or down... myself included !!!! so keep your hands off.